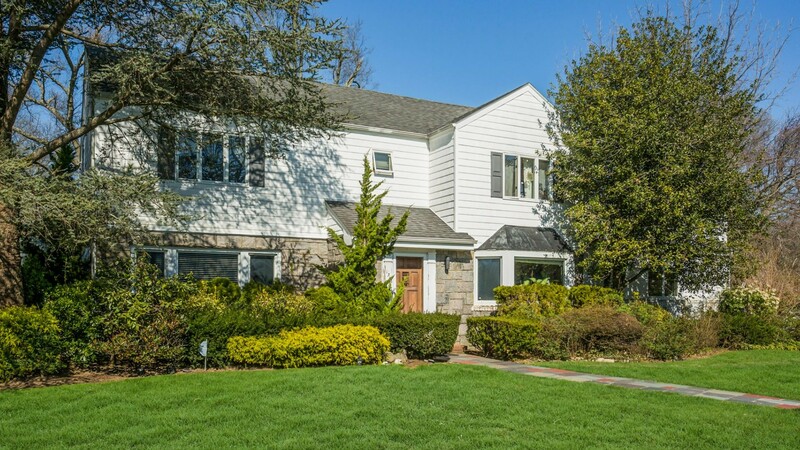 1348 West Boxwood is a charming center hall colonial seated on a park like property in Hewlett Harbor. Situated on a big green tree lined property, you truly get the country peaceful feels. As you walk into the house, there is a spacious living room on the left which leads you into the den. On your right there is a formal dining room that can entertain a large party. Additionally there are hardwood floors throughout the home. The den is a room you will never want to leave. It is full of sunlight from the floor to ceiling windows that are overlooking the backyard and the skylight window. There is also a wood burning fireplace to keep you warm. The dining room has a big window that offers lots of sunlight. From the dining room, you can enter the spacious eat-in kitchen. From here, you can access the backyard patio through the glass door. This is very convenient for summer entertainment. This kitchen has a lot of cabinets and a big pantry closet that is perfect for storing your shopping. The first floor also has a guest room with a full bathroom and a powder room by the den. Upstairs, there are 3 bedrooms. The master bedroom has a fully renovated ensuite luxurious bathroom. The mosaic inside this beautiful bathroom is truly one of a kind. Additionally, there are his and hers sinks, a separate shower room, and a linen closet. The other 2 nice size bedrooms have a full bathroom with a bathtub and shower. One of the bedrooms has a rooftop terrace that overlooks the entire property. The full and finished basement provides you with plenty of room for fun and play. There is a laundry room, utility room, and a big space that can be used for an office, a movie room, or just left for hanging out.